The band plays a stripped-down mix of punk rock, funk and dub, with an emphasis on the social and political ills of society. Gang of Four are widely considered one of the leading bands of the late 1970s/early 1980s post-punk movement. Their debut album, Entertainment!, was ranked as fifth greatest punk album of all time  and at Number 483 in Rolling Stone's 500 Greatest Albums of All Time. The album was listed by Pitchfork Media as the 8th best album of the 1970s. Their early 80s albums (Songs of the Free and Hard) found them softening some of their more jarring qualities, and drifting towards dance-punk and disco. David Fricke of Rolling Stone described Gang of Four as "probably the best politically motivated band in rock & roll." Gang of Four's music brought together an eclectic array of influences, ranging from the neo-Marxist Frankfurt School of social criticism to the increasingly clear trans-Atlantic punk consensus. Gang of Four was named by a member of the Mekons while driving around with Gill and King when he came upon a newspaper article on the intra-Party coup against China's "Gang of Four". The Gang's debut single, "Damaged Goods" backed with "(Love Like) Anthrax" and "Armalite Rifle", was recorded in June 1978 and released on 10 December 1978, on Edinburgh's Fast Product label. It was produced by the Gang of Four and Bob Last and Tim Inman. It was a Number 1 indie chart hit and John Peel radio show favourite. This led to two Peel radio sessions, which, with their incendiary live performances, propelled the band to international attention and sold-out shows across Europe and North America. They were then signed by EMI records. The group's debut single with this label, "At Home He's a Tourist", charted in 1979. Invited to appear on top rated BBC music program Top of the Pops, the band walked off the show when the BBC told them to sing "rubbish" in the place of the original lyric "rubbers", as the original line was considered too risque. The single was then banned by BBC Radio and TV, which lost the band support at EMI, who began to push another band, Duran Duran, instead. King's lyrics were always controversial and a later single, "I Love a Man in a Uniform", was banned by the BBC during the Falklands War in 1982. Critic Stewart Mason has called "Anthrax" not only the group's "most notorious song" but also "one of the most unique and interesting songs of its time". It's also a good example of Gang of Four's social perspective: after a minute-long, droning, feedback-laced guitar intro, the rhythm section sets up a funky, churning beat, and the guitar drops out entirely. In one stereo channel, King sings a "post-punk anti-love song", comparing himself to a beetle trapped on its back ("and there's no way for me to get up") and equating love with "a case of anthrax, and that's some thing I don't want to catch." Meanwhile, in the other stereo channel (and slightly less prominent in the mix), Gill reads (on the original EP version) a detailed account of the technical resources used on the song, which on the re-recorded album version is replaced by a deadpan monograph about public perception of love and the prevalence of love songs in popular music: "Love crops up quite a lot as something to sing about, 'cause most groups make most of their songs about falling in love, or how happy they are to be in love, and you occasionally wonder why these groups do sing about it all the time." Although the two sets of lyrics tell independent stories they occasionally synchronise for emphasis. According to critic Paul Morley, "The Gang spliced the ferocious precision of Dr. Feelgood's working-class blues with the testing avant-garde intrigue of Henry Cow. Wilfully avoiding structural obviousness, melodic prettiness and harmonic corniness, the Gang's music was studded with awkward holes and sharp corners. At the time, the band was recognised to be doing something very different from other white guitar acts. Ken Tucker, in Rolling Stone, 1980, wrote: "...rarely have the radical edges of black and white music come closer to overlapping... the Gang of Four utilize their bass guitar every bit as prominently and starkly as the curt bass figures that prod the spoken verses in (Kurtis Blow's "culture defining" huge summer hit) "The Breaks." In 1981 the band released their second LP, Solid Gold. Like Entertainment!, the album was uncompromising, spare, and analytical; such songs as "Cheeseburger," "He'd Send in the Army," and "In the Ditch" exposed the paradoxes of warfare, work, and leisure. Van Gosse, in a Village Voice review said: "Gang of Four embody a new category in pop, which illuminates all the others, because the motor of their aesthetic is not a 'personal creative vision.'" Dave Allen (who later co-founded Shriekback, King Swamp, Low Pop Suicide and the Elastic Purejoy) had left in 1981, and had been briefly replaced by Busta "Cherry" Jones, a sometime player with Parliament, Brian Eno, and Talking Heads. After working with the Gang to complete their North American tour obligations, Jones left to work with the Rolling Stones and was replaced by Sara Lee, who was Robert Fripp's bassist in the League of Gentlemen. Lee was as good a singer as bassist, and she helped give the band's third studio album, Songs of the Free, a more commercially accessible element. Although "I Love a Man in a Uniform" from the album was the band's most radio-friendly song, it was banned in the UK shortly after its release because Britain went to war in the Falkland Islands. In the spring of 1983, Burnham left the band after the release of Songs of the Free and formed Illustrated Man. Gill and King continued Gang of Four, releasing Hard in 1983. 1986 saw the release of The Peel Sessions, a collection of rawly rendered material recorded during the period 1979 to 1981 for British radio BBC. Melody Maker dubbed the album "a perfect and classic nostalgia trip into the world of gaunt cynicism." After retiring from working together, Gill and King reunited to record Mall in 1991, and finally Shrinkwrapped in 1995. Lee later joined the B-52's to be replaced by Gail Ann Dorsey, later famous for her longtime association with David Bowie. The original lineup of Jon King, Andy Gill, Dave Allen and Hugo Burnham reformed in November 2004. A UK tour in January 2005, shows in Europe and Japan and tours of the United States in May/June and again in September. In October 2005, Gang of Four released a new disc featuring new recordings of songs from the albums Entertainment!, Solid Gold and Songs of the Free entitled Return the Gift (which featured Mark Heaney on drums) accompanied by an album's worth of remixes. In January 2011, the band, now featuring Mark Heaney on drums (a band member since 2006 who had toured extensively since Burnhams departure) and Thomas McNeice on bass, released a new album, Content. Andrew Perry, writing in Britain's Telegraph newspaper, gave it (21 January 2011) a 5-star rating and said that it was "their best record since the Seventies", Jon Pareles, awarding the album 4 stars in a New York Times review of 25 January 2011, declared that [the band] "have reclaimed, with a vengeance, their old attack", Dan Wilcox of KCRW (17 January 2011) said [of Content]: "Entertaining, scintillating and dangerous, the band has lost none of its explosive edge over the years." In his Pitchfork review of the album, 26 January 2011 Stuart Berman wrote "If Gang of Four's 2005 reformation proved they could more than hold their own against the upstarts, then Content shows that their chief concerns – the financial and psychological toll of keeping up with the Joneses – resonate all the more loudly in an Internet-accelerated era where even those on the vanguard can feel behind the times, and where the lawless, anonymous nature of online exchange threatens to overwhelm our identities. It's thus fitting that the album's most exuberant moment – the muscular Motown stomp "Who Am I?" – is used to soundtrack a modern-day anarchist's existential crisis: "You can't steal when everything is free". Following successful tours of the US, Australia and Europe in 2011, King and Gill ceased working with each other. Gill produced, under the band name, What Happens Next, which was released in 2015. Gang of Four went on to influence a number of successful alternative rock acts throughout the '80s and '90s, although few of their followers were as arty or political. R.E.M. frontman Michael Stipe cites Gang of Four as one of his band's chief influences; Flea of the Red Hot Chili Peppers has stated that Gang of Four were the single most important influence on his band's early music . Kurt Cobain stated that Nirvana started as "a Gang of Four and Scratch Acid ripoff". Gang of Four's debut album Entertainment! was ranked 13th in Kurt Cobain's list of his 50 favourite albums in his journal. Andy Kellman, writing in AllMusic, has even argued that Gang of Four's "germs of influence" can be found in many rap metal groups "not in touch with their ancestry enough to realize it". Sara Lee was also a judge for the 5th annual Independent Music Awards to support independent artists' careers. 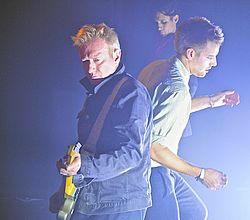 In recent years the band has enjoyed a resurgence in popularity, initially due to emergence of new post-punk revival bands such as Clinic, Liars, the Rapture, Neils Children and Radio 4, and then the rise of Franz Ferdinand, We Are Scientists and Bloc Party, which led to the renewed patronage of the NME. ^ Caffrey, Dan (18 February 2015). "Gang of Four – What Happens Next". Consequence of Sound. Retrieved 19 January 2016. ^ Isler, Scott; Robbins, Ira; Azerrad, Michael. "Gang of Four". Trouser Press. Retrieved 25 April 2015. ^ "40 Greatest Punk Albums of All Time". Rolling Stones. Retrieved November 4, 2016. ^ "Staff Lists: Top 100 Albums of the 1970s | Features". Pitchfork. 2004-06-23. Retrieved 2012-02-19. ^ David Fricke, Rolling Stone, 7 Aug 1980. ^ "Gang of Four - Superplayer, músicas para ouvir". Superplayer.fm (in Spanish). Superplayer. Retrieved November 4, 2016. ^ ClashMusic. "Gang Of Four Track By Track". Interview. www.ClashMusic.com. Retrieved 2 June 2010. ^ "16 songs banned by the BBC". BBC Four. Retrieved November 4, 2016. ^ a b Mason, Stewart. "Anthrax" (DLL). Song Review. allmusic. Retrieved 26 August 2008. ^ Perry, Andrew (21 January 2011). "Gang of Four: Content, CD review". The Daily Telegraph. London. ^ Ratliff, Ben; Chinen, Nate; Pareles, Jon (24 January 2011). "New CDs From Destroyer, Amos Lee and Gang of Four – Review". The New York Times. ^ "Gang of Four: Content – Album Preview on KCRW". Kcrw.com. Retrieved 2012-02-19. ^ "Gang of Four: Content | Album Reviews". Pitchfork. 2011-01-26. Retrieved 2012-02-19. ^ Lester, Paul (2008). Gang of Four. Music Sales Group. p. 1. ^ "Top 50 by Nirvana [MIXTAPE]". Archived from the original on 18 October 2014. Retrieved 8 May 2013. ^ "Review of Entertainment!". allmusicguide. Retrieved 28 March 2008. ^ "Independent Music Awards – Past Judges". Independentmusicawards.com. Archived from the original on 13 July 2011. Retrieved 2012-02-19.